For some, beets are an acquired taste. I, however, grew up eating them. My Grandma's beet barszcz was one of my favorite foods, and I never turned up my nose to jarred pickled beets. 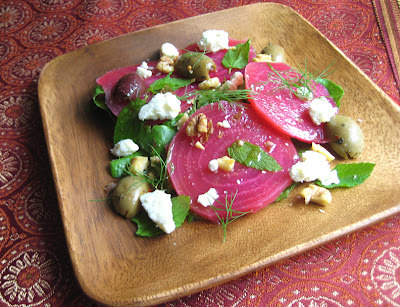 But red beets have that distinctive earthy flavor that can be hard for some to take. Other colors of beets can be milder - I've had orange beets that were as naturally sweet as candy, without the dirt flavor. The same goes for chioggia beets. The sweetness of beets makes them a perfect pairing for salty and tangy flavors, like vinegar, mustard, feta cheese, and olives, and an ideal salad ingredient. I like to add toasted walnuts, too, for a bit of buttery crunch. Scrub any dirt off the beets and place them in a saucepan with water to cover. Bring to a boil, then reduce heat to a simmer. Simmer for 45 minutes to 1 hour, until the beets are easily pierced with a knife. Turn off heat, remove beets from water, and allow to cool to a temperature comfortable enough to handle. Peel off and discard the skins. Slice the beets. Place the orange juice, vinegar, mustard, and salt into a small bowl and beat well with a fork. Add the spices and beat again. Drizzle in the olive oil, beating constantly, until the ingredients are emulsified. Taste for seasoning and add more of whatever you think it needs. If you prefer a sweeter vinaigrette, whisk in a few drops of honey or agave syrup. For each serving, place a handful of greens on a serving plate. Top with half the beets. Drizzle with a few spoonfuls of the dressing (whisk again if it has un-emulsified). Top with crumbles of feta, some sliced olives, pieces of walnut, and dill and mint.